We set the course for Cape Pelegrin and slowly sail into the Pakleni Channel. 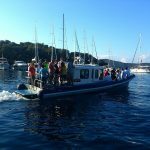 When sailing around Hvar the images and landscapes change down the length of its eighty nautical miles. 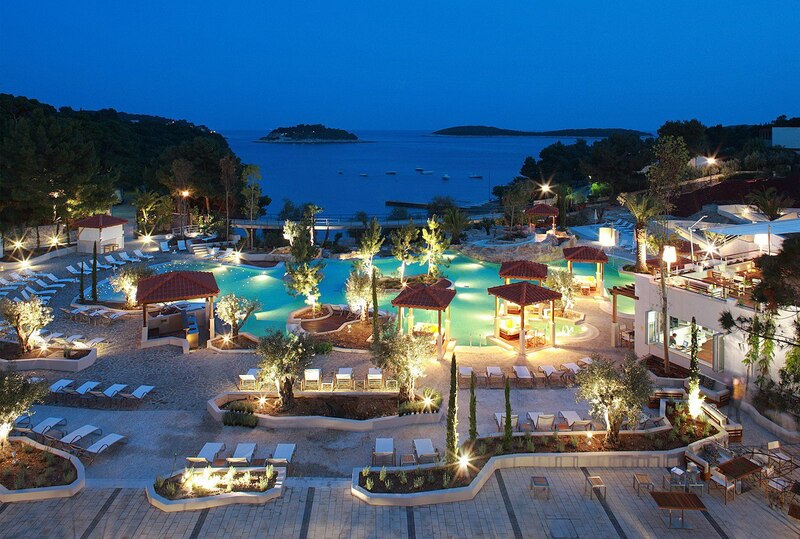 The Dionysian and spirited town of Hvar with its Paklinski islands is the summertime centre of the world. Everything is teeming with life and hundreds of boats dot the two mile wide channel. 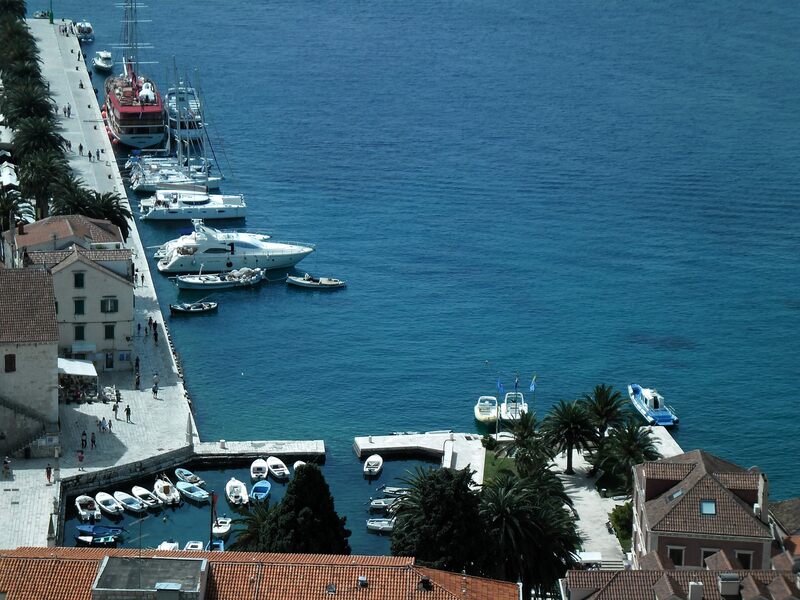 The waterfront in Hvar has been taken by the big yachts. Those slightly smaller jostle for space, anchoring in the middle of the harbour. 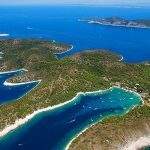 They are all in search of Hvar’s summer magic, its buzzing squares and streets, the mystical atmosphere of its churches and monasteries, Lucullan feasts and intoxicating wines pressed from the grapes of the island’s southern slopes. 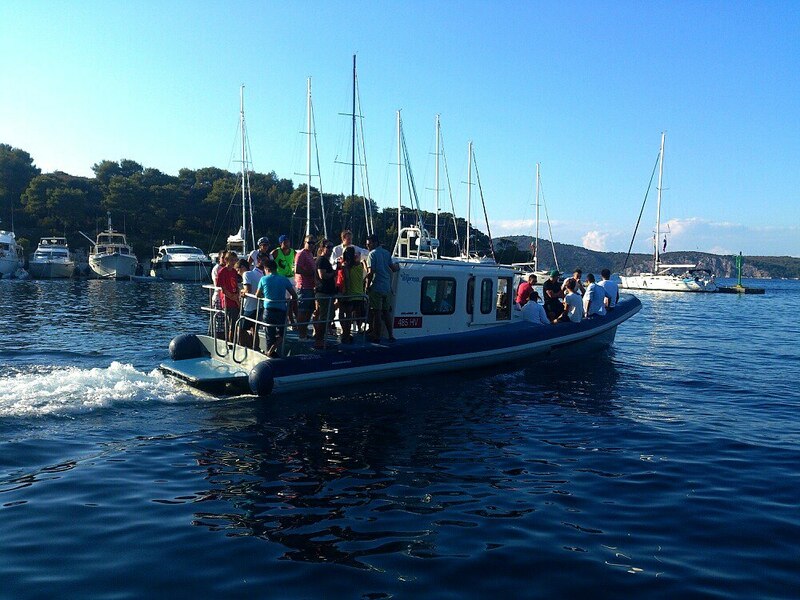 In daytime the boats and yachts in Hvar move to the coves of the islets across the way. Ždrilca, Stipanska, Vloka, Taršće and Vinogradišće are just a few, all linked by the clear sea and the inns in which fish and wine are excellent. We leave the archipelago sailing eastward past the islet of Pokonji dol, and on along the uninhabited coastline, intersected with strands and protruding promontories before reaching the sunny coves of Milna and Dubovice with their virgin white strands tempting us to stop for a swim. Sailing onwards to Sučuraj, a settlement on the island’s eastern headland, we pass an inhospitable coast. It offers no shelter to a yachtsman, but the sheer slopes of Sveta Nedija, Ivan Dolac and Zavala – where vineyards seem to be positioned vertically, reaching for the skies – are truly bewitching. Shelter can be found only in the nearby Ščedro. With the port of Lovišče and the cove of Mostir on its northern shores, and the coves Borovo and »arnjeni on the south, Ščedro was a vital point on the ancient sailing routes, the only shelter from a strong southerly. It was also the scene of a battle between Pompey and Julius Caesar in the year 49 B.C. In the 16th century the Dominicans built a monastery on Ščedro. There are no longer permanent inhabitants on the island. They only come in the summer when all of its coves are occupied by sailboats, yachts and fishing boats. 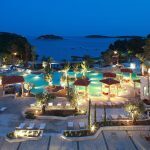 We sail on along the charming coves in which a handful of houses have nestled, Srhov Dolac, Torac, Smarska The highlands of Hvar melt away and descend towards SuÊuraj, which almost seems to be heading for the mainland and the mouth of the Neretva River. This is a busy and important island harbour in which ferries bring all and everything that arrives to the island from the south and the east. There is, nevertheless, also room for yachtsmen along the pontoons built a few years ago. 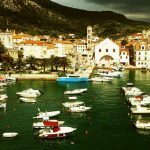 From Sučuraj we sail along the island’s northern shores, and all the way to Jelsa the scenes around us are entirely different. There are not too many boats. Instead of open seas our view is blocked by the bulk of the Biokovo mountain, and should a north-easterly winds swoop from it we will be hard pressed to find shelter before Jelsa which is two mile away. In the solitary coves of Bristova, Pokrivenik and Stiniva along the route the local population is more oriented towards their fields than the sea, and consequently, there are not too many places to moor or drop anchor. You can only do so in Pokrivenik. Quite a different picture again around Jelsa and Vrboska – Jelsa with its harbour and Vrboska with its wonderful, almost a mile and a half deep inlet, tempt us to sail into them. 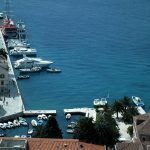 Safe berths can be found at the waterfronts of both places, and in the ACI marina in Vrboska – which is known as the Venice of the island. The local church of St. Mary played a double role – in addition to its spiritual role, its also served as a defence fortress and as such was equipped with cannons. One should take time and walk the three bridges that link Mala banda with Vela banda, and visit the Fishing Museum, a place that recalls the labour and hardship endured by the island’s fishermen, who lived without sounders, electric winches and fishfinders – relaying only on their nets, lanterns and tridents. 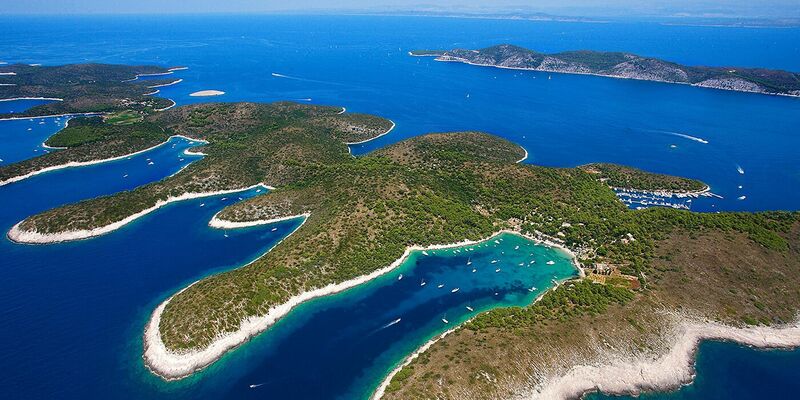 The sail to Stari Grad is a full fifteen miles, and along the way we will pass some forty coves and inlets. Among these is Žukova, which surfers from Zlatni rat on the island of BraË speed to when there is a strong maestral blowing. The high level of indentation of the coastline, which has created some of the Adriatic Sea’s most stunning panoramas, is completed by the islet of Zečevo, half a mile to the north of the exit from the harbour at Vrbovac. 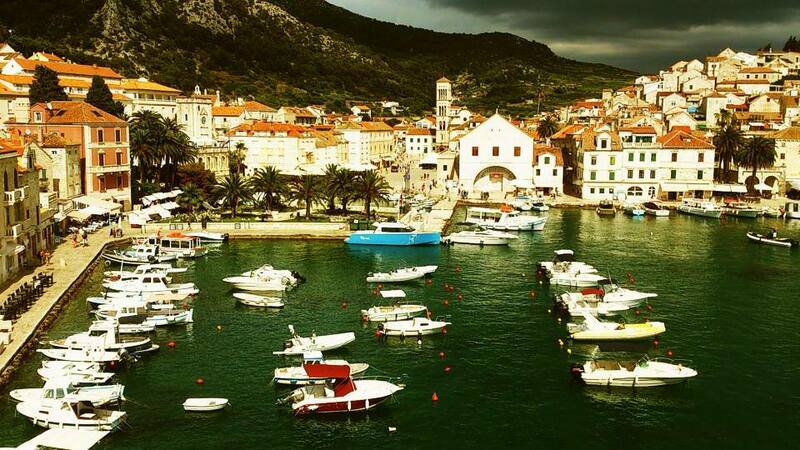 The Stari Grad Bay, recessed almost five miles inland, is reminiscent of sailing into a northern fiord. Its many coves, the vegetation and – at the very far end of this deep inlet, the town at whose waterfront you moor you boat, will bring you back to the Mediterranean reality of today, but also evoke the distant past when this town was founded almost two and a half thousand years ago. It is hard to say what is more attractive here: the Stari Grad Range in which the land division from the period of Antiquity can still be discerned, the stone-paved streets, , Tvrdalj – the summer residence of the 16th century poet Petar Hektorović, or the music that flows through the town when night falls on a summer concert. Onward to Cape Pelegrin and we again pass white strands and seaside settlements. Ahead of us are Gračišće, Lućišće and Stiniva. A glance at the peaks of the hills will reveal that these are just the ports of what were once the large settlements of Grablja and Brusje. A little to the west is the old ferry port, Vira, now a welcome mooring post for fishermen. Having reached Cape Pelegrin we turn back to the town of Hvar. The circle is closed. The tour of the island is complete.